The Human Division is many things at once; it is, of course, a new story in the Old Man’s War universe, but it’s also an experiment in digital distribution. It feels a bit like the modern equivalent of a fix-up novel, but also vaguely resembles the first season of a TV show. It’s a business model as old as Charles Dickens (older, perhaps), but it’s also uniquely well-suited to the world of ebooks. 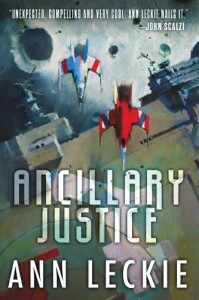 It’s an excellent addition to Scalzi’s most well-known fictional setting even though it’s not my favorite in that world or my favorite Scalzi book (Redshirts is a hard act to follow). In very broad outlines, The Human Division tells the story of Lieutenant Harry Wilson, his friend Hart Schmidt and the missions of the Clarke as its crew and diplomatic corps work to heal the rift between Earth and the Colonial Union. However, instead of adding up to parts of a unified whole, the episodes unfold more like standalone adventures in a television show that disregards traditional broadcast storytelling structures. 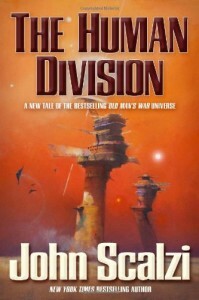 Unlike a TV show, the episodes generally have one storyline (no subplots here), and Scalzi occasionally focuses entire episodes on characters seemingly unconnected to the main plot. The Human Division also has episodes that – while they certainly contribute to the overall whole – could be lifted out of the story wholesale to stand entirely on their own… and I don’t just mean the ones that focus on other characters. Episode 7, The Dog King, is a humorous aside about an unfortunate incident with a diplomat’s pet dog that feels like a complete story in and of itself. It’s followed by my favorite episode of the series, The Sound of Rebellion, which focuses on one-time characters but also feels like something you could read and enjoy without much prior knowledge. I do think that if you go into this series expecting it to end up shaped like a novel, you’ll probably be disappointed. Apparently the final episode has garnered a number of one-star reviews, and I’m not surprised because it honestly doesn’t provide much in the way of closure. It doesn’t have a cliffhanger ending, but it plays more like the season finale for a show that expects to let its major conflict play out over more than one season. That’s why I’m glad I listened to it knowing that a second “season” would be forthcoming. I wouldn’t have been upset, mind you, but it does help to set expectations accordingly. Overall I liked the series, but I was a bit disappointed that it didn’t have the emotional punch of Redshirts or Fuzzy Nation. However, from what I can remember, that’s also generally true about the earlier Old Man’s War books, so perhaps your mileage may vary. I did feel like the character development was a bit limited throughout, but Scalzi compensates by keeping most of the episodes plot-driven and full of action. In any case, I’m glad he’ll be continuing this story with another “season” of episodes, because I’d like to find out what happens next.